Welcome to the last day of February! Or, for some of you, the first day of March *wave to Pakistan*. Beware the Ides. Anyway, things are clicking along quite well. I’ve been stretching my wings a bit this week---I sent a short story to a contest, applied to a writing workshop in Seattle, and entered a pitch contest with Nadya. We’ll see what comes of it, but it feels good to be spending more energy pushing on the publishing world. Interest in Soulwoven has picked up again on Wattpad, and I’m pleased as peaches. At this rate, it’ll hit 200,000 soon and get the coveted bold, shiny red text for its read numbers. I’m very excited about that. Wattpad and I are also working on some social media promotion for it, which should be cool as well. And most importantly, when going back through it to pull quotes for that, I realized I still totally love it. That matters a lot. It doesn’t always work that way once you call a book finished and move on to the next one. I’m starting line edits on Nadya. The feedback on it has been overwhelmingly positive and has helped me make a few last tweaks, and I think it’s almost ready to fly. I hope to start sending it around to agents in the next few weeks. 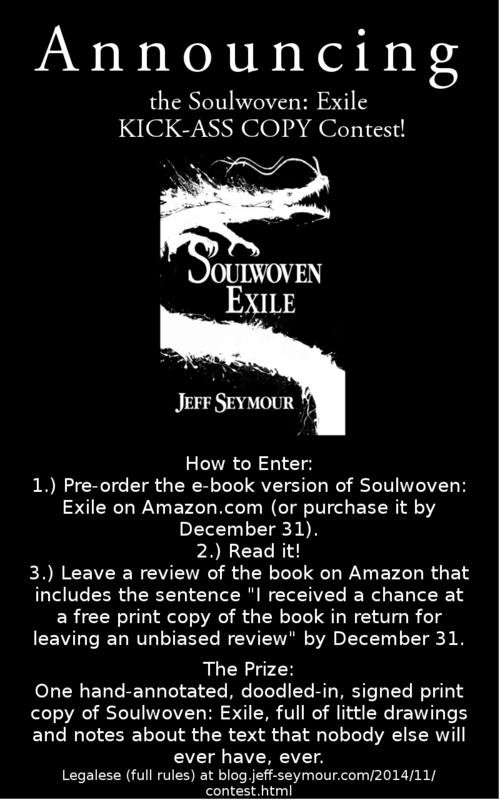 And once that’s done, I’ll get back to work on Soulwoven: Exile, I promise. I have all my ducks lined up for it now, and it’s just a matter of grinding through and doing the revisions, so hopefully that will be ready for mass consumption sooner rather than later. AND I’ve started doing page design on Three Dances. I have a few technical hiccups to overcome, but I expect the Digital Deluxe Version, with enhanced artwork, to be ready very soon. Which is SUPER EXCITING, because then I can set a launch date and start doing promo work and generally kick things off. I have another free Saturday this week, so I’ll be doing first-page critiques at 1:00 PM on Wattpad again. As always, the first two slots go to followers, so message me if you’re interested. Or if you have a friend who might be interested, tell them to do the same. Thanks, thanks, thanks for all your support. This writing thing is going to fly sooner rather than later.